No fever but very nauseous. We were waiting in Nuclear med when Ryan started throwing up. I grabbed the closest trash can and saved a greater mess on the him, the wheel chair and the floor. We got him situated in the scanner and about a quarter of the way through the scan it happened again. He is very drugged up right now, so I reached the bucket into the scanner and caught it all. He never missed a beat and the Physicist said "we're doing good, let's not stop now". He finished his scan 20 min. later, then threw up one more time. He is back in bed now, resting but still very nauseous. If this is the worst...Thank you ! 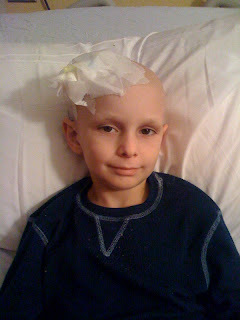 Ryan checks into Sloan tomorrow to gear up for the 3f8 antibody test dose on Wednesday. We are hoping and praying that the pain will be tolerable and nausea kept to a minimum. The easier it goes this time will surely help with getting him back up here for the next round. Missy will be coming up with him next Tuesday through Friday. We met with Ryan's NY buddy Jon, for lunch, then toured "ground zero". We ferried around the Statue of Liberty and finished the day with a theme dinner at the "Jekyll and Hyde" restaurant. Lots of fun! Please keep Ryan in your thoughts and prayers the rest of the week as we move into the unknown for us. Les, Missy, Heidi, Will and SuperRyan. We finally hit the town! We had a great time at Family Camp last weekend, as usual. We missed Heidi, as she had an important soccer game in the middle of the day on Saturday. Thank you, Camp Sunshine! We did have a great time as usual at Camp Sunshine this weekend. It is just soooo hectic it hard to think straight. Worrying that everything is done and up to date, that Heidi and Will are OK, that they are going to have a smooth trip to NY next weekend to meet us. I have to thank all the friends of ours and Ryan's who have helped us out. Everything is so very much appreciated. Good News and very, very sad news. The good news came in an email this morning from Erika. Ryan's marrows are clear. Hooray!! With all this sleeping, we have been really worried about him. We know this is typical, but it is still hard to see him feel bad. It is usually so comforting to be with him because he usually feels pretty good. We haven't been too comforted lately. Ryan will have his MIBG scan done in Atlanta next week. The following week we will head to NY to have the remaining tests completed. The week after that we will run a test dose of the 3f8 antibodies. Then, finally, treatment begins. This is going to be a really tough schedule on Ryan. When you have to look ahead like this, it just so hard to imagine doing it. With the good Lord and great Doctors with us, we will come out the other side of this course, then begin to plan the next one. Ryan is the most incredible fighter, brother, son, comedian and hunter! you will ever meet. We are so unbelievably grateful to have him in our lives. Wish us strength, wisdom and patience. Les, Missy, Heidi, Will and SuperRyan. We are trying to get Ryan's MIBG injection and scan done here in Atlanta, next week. We will try to accomplish all the other tests he needs, the week of the 13th, in New York. This will eliminate at least one trip. It is going to be hard enough to get him to go several times. Thank you for all your support. Les, Missy, Heidi, Will and SuperRyan. Finally have a schedule !